It feels a little counterfeit writing a review for a soundtrack to a film I've only seen a trailer for. Then again, the movie pertains to a musician, and as such, the music should ideally precede the story-line, so maybe this isn't that much of a moral quandary after all. Truth be told, not may of us were anticipating any sort of bio-pic about Memphis' sadly unheralded Van Duren, because, well...a good 99.99% of the warm bodies inhabiting this country have no familiarity with the man in question. In 2016 a pair of Johnny-come-lately fans in Australia (Wade Jackson and Greg Carey) were exposed to Van Duren's first album, Are You Serious? Ironically, that record was released four decades prior in 1978. 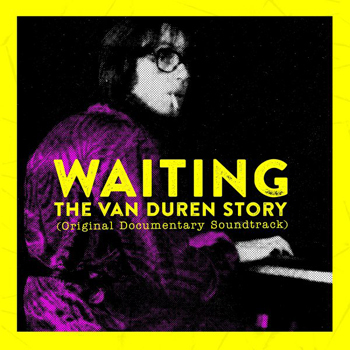 Despite the 40-year delayed reaction, Jackson and Carey were so enamored with the music they were compelled not only locate it's creator but to parlay his backstory into a documentary, Waiting: The Van Duren Story. Aside from some screenings in Memphis in late 2018, the movie hasn't seen widespread release (though that should be on the horizon). I can't speak to how Van Duren's life, or even certain pivotal events inspired his songs, simply because that history isn't available to me, at least not in full. This critique will focus on the music itself, and luckily, if you're at all piqued about the topic at hand the perfect gateway awaits you in the form of this soundtrack. Van Duren put down roots in the Memphis music community in the mid-70s, ingratiating himself with the Ardent Records crowd, though he never recorded for the label. He was however a collaborator with two alum from one of Ardent's most renown stablemates, Big Star. I'm not privy to whether how much (or if any) historical evidence exists to show for it, but circa 1976 Van Duren was in cahoots with a post-Star Chris Bell and Jody Stephens in a presumably short-lived local outfit, the Baker Street Regulars. They haven't been heard from since. Big Star's shadow was barely beginning to loom, but if Alex Chilton & Co. were merely a whisper in the 70s, Duren was a veritable ghost. By and large that's how it would stay. For shame Van Duren, and Are You Serious? was such a carefully guarded secret, because as a budding popsmith he was busting out tunes in the mold of McCartney, Rundgren, Emitt Rhodes and Eric Carmen. He may not have possessed the angsty, soul-bearing tumult of Big Star, but Serious' "Grow Yourself Up," "Positive" and the subdued "Waiting" were piano-laden confessionals that skipped many a poignant stone in spite of grazing such topically familiar waters. Van Duren may have possessed the acumen of his peers, but the all-crucial "big break" never materialized. At one point he was even taken under the wing of Rolling Stones manager Andrew Oldham, but success was ultimately elusive. A subsequent record in 1979, Idiot Optimism was shelved and didn't see the light of day until 1999...as a scarce Japanese import no less. The '80s was Duren's last genuine gambit to thrust himself out of the woodwork, this time in the guise of a fully amplified, radio-gunning power-pop combo, Good Question, whose lone record (and a fantastic one at that) Thin Disguise I featured on these pages some time ago. It didn't chart but it contained what would become one of his signature pieces, "Jane." The soundtrack for Waiting offers an ace cross section of Van Duren's career, underexposed as it's been heretofore. There's a smattering of material from his two solo records, two representative cuts from Good Question, and even some live and unreleased offerings. One major highlight for Big Star devotees is a cover of Chris Bell's "Make a Scene," a tune posthumously released on Bell's I Am the Cosmos album. Waiting will be available physically from Omnivore Recordings on February 1st, as well as from iTunes and Amazon. To keep abreast of widescale release of the movie, please check Waiting's website periodically. Thanks for this review. I love Are you Serious? but had heard nothing about this film. Next time you do your re-ups could you do the Good Question record? Usually, I don't feel much guilt with downloading music, but with Van Duren it's different. Not only does it appear that he was treated unfairly in the music industry, but if you've heard any of his outpour, he doesn't add 'filler' to his music releases.